Archives : BULLISH ENGULFING ON WEEKLY CHARTS - 20/04/2012. BULLISH ENGULFING ON WEEKLY CHARTS – 20/04/2012. NIFTY NEEDS A CLOSE ABOVE 5344. It was the second consecutive Friday when things went wrong in the later half of the trading day. This week the fall must have been a result of automated system going wrong. But leaving aside this minor hiccup, the week went quite well. Last three days saw the market halting at the Resistance zone of Sensex 17530 - 17570 and Nifty 5336 – 5344. If the market has to move any higher than it is imperative that the market move above this Resistance zone and close above Sensex 17570 and Nifty 5344. Sensex opened the week at 17047, made a high of 17530, low of 17010 and closed the week at 17373. Thus it registered a weekly gain of 279 points. At the same time the Nifty opened the week at 5190, made a high of 5342, low of 5183 and closed the week at 5290. Thus the Nifty went up by 83 points on a weekly basis. Nifty has formed a Bullish Engulfing pattern on the weekly charts, which is a Bullish Reversal pattern. On the other hand, Sensex just fell short of forming a Bullish Engulfing pattern. On the daily charts, Friday saw a small black body formation with long upper and lower shadow on the lines of Spinning Top. But if we observe the last three days candles, it is observed that both the indices are halting at the same level, making a case for Tweezer formation. Even though it is a Tweezer formation, one cannot classify it as Tweezer Top because of a lack of prior trend. But nonetheless a close above Sensex 17530 and Nifty 5342 will negate whatever bearishness that might have crept in due to the Tweezer formation. Weekly charts promise more bullishness than the daily charts. Both Sensex and Nifty have managed to close above the short term average of 20dma (Sensex – 17293 and Nifty – 5261) and as a result the short term trend has once again turned up. Both the indices continue to remain below the medium term average of 50dma (Sensex – 17552 and Nifty – 5336) but above the long term average of 200dma (Sensex – 17047 and Nifty – 5138). As a result, the trend in the Short term timeframe has turned Up, whereas the trend in the Medium term timeframe remains Bearish. The trend in the Long term timeframe continues to be Bullish. Currently both the indices face resistance at the Downward Falling Gap created three weeks back between Sensex 17553-17570 and Nifty 5338-5344. This gap acted as a resistance three times during the current week, creating almost a Tweezer like formation. A close above this gap will pave the way for further upward movement. Bullish Rising Gap between 5203 – 5194 in the Nifty has acted as a support for last three weeks and will continue to act as a strong support. Market went down upto the level of the Falling Channel Top twice in March and it acted as a strong support. Currently the Falling Channel Top comes in at Sensex 16810 and Nifty 5076. These levels should provide strong support for the market. The overall bullish long term target for Falling Channel pattern breakout remains intact. The targets as per this formation are Sensex 20383 and Nifty 6148. Both the indices are encountering strong Resistance zone between Sensex 17530 - 17570 and Nifty 5336 – 5344 which is a result of the confluence of the current intermediate tops, Downward Falling Gap and the 50dma. A close above this Resistance zone will ensure resumption in strong upward momentum. A strong support is likely to emerge between Sensex 17047 – 16920 and Nifty 5183 -5135 which is a result of confluence of immediate bottoms and the critical level of 200dma. MACD is in Buy mode but in the negative zone. ROC has just turned negative and has given a fresh Sell. RSI is just hovering nearing the equilibrium line and continues with its Buy. Stochastic Oscillator (68) continues in Buy mode as %K is above %D. ADX has moved further down at 11 indicating lack of direction in the market. Directional Indicators are in Sell as +DI is below –DI, but the indicator has been giving a lot of whipsaws of late and cannot be given great importance. MFI has just moved in Buy zone at 52 suggesting money flowing in the market while the OBV has made a higher top and a higher bottom formation which augurs well for the market. Nifty O.I. PCR is at 1.25. Highest open interest buildup is seen at 5200 Put and 5400 Call. This suggests an immediate range of 5200 to 5400. Next month series has seen strong open interest buildup at 5600 Call and 5000 Put. Thus one can expect the Nifty to move in a wider zone of 5000 on the lower side to 5600 on the higher side. 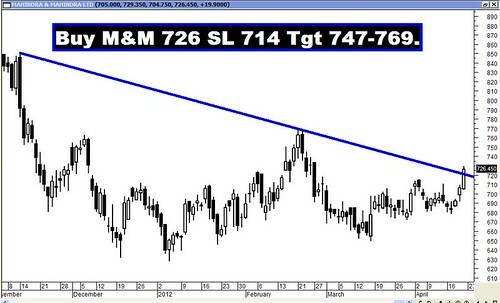 Trendline Resistance for the Sensex is at 17630. The Trendline Support for the Sensex is at 16954. Trendline Resistance for the Nifty is at 5367. The Trendline Support for the Nifty falls at 5156. For the week ahead, Sensex will find Support at 17075-16766-16433 and will find Resistance at 17687-18000-18326. For the week ahead, Nifty will find Support at 5195-5099-5011 and will find Resistance at 5378-5461-5545. Last week all the recommended pairs did well as the Buy recommendations in all the pairs reached their targets with ease. But the Stars for the week were Hero Motocorp and JsW Steel.